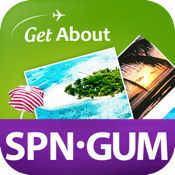 You can get helpful contents that we've collected by ourselves through Saipan/Guam Tour App! No more search on the internet about information that famous restaurants, sights, activities and accommodations~! 1. Collected specific information about famous restaurants in Saipan/Guam with detailed map. 2. Information about shopping malls, sights, museums and tourist attractions. 3. Information about interesting festivals and various activities in not only center of Saipan/Guam but also outskirts. 4. Detailed information about over 150 hotels and resorts. 5. Recommended schedules when you travel with parents, friends, children, lovers or travel alone. 6. Reviews of skilled travelers in blog format. 7. Travel videos in Phuket by Sticker that are uploaded on YouTube. 8. Real-time information based on Twitter. 9. User's assessment on your own page, sharing with other users. 10. Notice board that you may find out notifications and GetAbout app events information. 11. Information about locations of restaurants, sights, activities and accommodations around you. 12. Downloading fuctions that you can download contents each area and then use them without WiFi and 3G/4G network. Thank you for using GetAbout Saipan/Guam and we will continue to improve our services and to provide up-to-date services. We'd like to get feedbacks from you also if you have any question or problem, don't hesitate to contact us. You can send message to us by using 'Send Feedback' menu on Setting in GetAbout Saipan/Guam App. Unimaginable GetAbout Saipan&Guam Saipan&Guam eviscerates information only can meet the exhaust. Containing the ever-changing world of Saipan&Guam GetAbout travel. ~! GetAbout in travel products, alarm notifications, LBS location-based services, mobile advertising can meet. 1 Specials, local tour GetAbout in Saipan&Guam now upgrade to existing travel information services, as well as provide a more affordable travel services. 3 Can receive alarm notifications to push through foreign or domestic events, festivals, etc. 4 LBS location information services to customers by providing the most important factor in using location-based services can be used application.